ASLSK #3 published by Multi Man Publications. I am not going to review or do my usual combination of AAR with sequence of play analysis, there are already better places to go for such things. The simple fact is that Starter Kit #3 is a superb package, offering much and at good value. Rather, the basis of this post is to reflect on my experiences of trying to get into ASL using Starter Kit #3 as a gateway module. At this point in time, SK #1 is unavailable (to be reprinted shortly) and SK #2 is available in limited numbers by the publisher while awaiting a reprinting. SK #3 is fully available at retailers, which is how I got my copy in the U.K. and why I am using that to learn the game. I should point out that I do not approach this subject with fresh eyes. I have some prior knowledge of the system, having owned the Squad Leader series (1978 era) and ASL up to the Gung Ho release, all were sold. I also owned all three starter kits a few years ago, though only used kit #1, selling them all a short time later. So here I am again, wanting to hop over hedges and dash from building to building and using a newly acquired ASL Starter Kit #3 to do that. The box is sturdier than last time I owned it and I like that. (Edit - I have just obtained ‘Beyond the Beaches at an eyebrow raising price at a UK outlet and Starter Kit #2 is on the way to me from MMP). U.S. and German squads with their respective medium machine guns. The counter in the middle is a pin marker. The kit #3 rulebook - As a (relatively) new player the system, I of course wanted to start with just the infantry part of the rules. So I mentally junked section 6 (guns) and section 7 (vehicles), together with all the text highlighted with a salmon coloured background (which introduces new kit #3 material into the general body of the rules) and section 3.2.4 that covers the ‘to hit’ process (for guns). I read the relevant parts of the rules twice and then dipped back into those areas that felt a bit more convoluted such as the various types of defensive fire (which actually is nicely summarised in a highlighted text box). 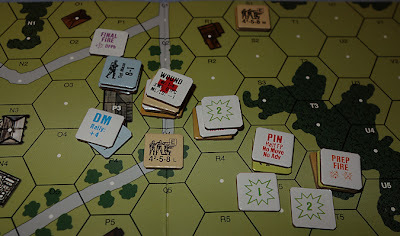 I think if I was brand new to ASL, I would want to just put out a few squads on a mapboard and practice the rules on them, but I felt okay with going straight into a full scenario and that probably says much for the success of my dabble in starter kit #1 a few years ago. 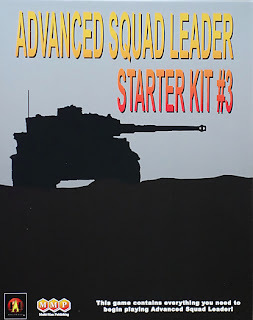 Unfortunately from a ‘beginners’ perspective, there is just one ‘infantry only’ scenario (S20 - Joseph 351) in kit #3, so that would have to be my introduction to the game. 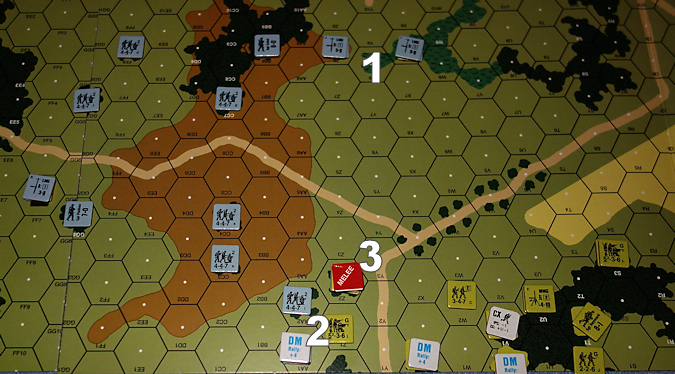 The scenario (Aug 44) basically involves a mixed bag of German forces on a hill and they are about to be frontally assaulted by a mixed bag of Allied units (elite U.S. forces and poorly armed allied troops). The Germans need to hold the hill until after turn 4 (otherwise they automatically lose if the hill is captured), but since victory is then determined by the casualty rate, they may want to fall back and retreat off the map before they suffer too many casualties. However - baring their route of retreat are a bunch of escaped Russian prisoners (7 units at 4-2-6 values), which adds an interesting twist to things. The Allied forces are randomly generated with a die roll, which also generates the VP level needed for them to win (I rolled a ‘3’ for anyone looking at that scenario now). Following set-up, my first game took 1 hour and 58 minutes to play through. defenders have been firing on the moving squads. Within the opening minutes, I was flicking through the rules. What are the effects of brush, the effects of orchard, how does elevation work in terms of line of sight, is the rout phase a dual phase, do pin markers come off at the end of the turn? Etc. Game 1, turn 1 must be a testing time for any new player. I muddled through and the turns did get easier with the repetition of some of the basic principles being played out. It is important that the new player understands that while this initial learning curve is steep, it is relatively short before the basics are understood and perseverance is worthwhile due to the richness of the system that lays beyond. By turn 5, the Germans started to break away from the hill to try and retreat off the map (blocked by the said escaped Russian prisoners). The Americans pressed on with the task of causing casualties to get victory points. Almost half the German force got caught by the Americans out in the open as they tried to extract themselves from the hill and through repeated routs and attacks, they were pretty much chewed up. On turn 7, I did not even have the allies take much of their player turn as there was nothing they could do to prevent the last few successful German units exiting the map. The Allies needed 18 VP’s to win (via casualties) and they secured 17, so a close game indeed. After playing I went to Boardgamegeek to read the ‘Infantry in battle’ tutorial by Jay Richardson. It is excellent, a link is also held at Consimworld in the header of the ASLSK folder. 1/ the +1 Self rallying modifier for the non leader rallied MMC check. 3/ the -1 to rally checks in woods. I also forgot the special scenario rule that allows all Russian prisoners to attempt self rally in every rally phase and to use smoke and to reduce the breakdown number of MG’s during subsequent First Fire and to add +1 for Assault Fire in the Advancing Fire Phase, and ..... it just goes on of course (smile). However, this is just reflective of the learning curve to the system. I know I missed more, but as I played, I hadn’t noticed, so it didn’t actually harm the ability to play and have fun (i.e. you don’t know what you don’t know) and it just needs to be accepted that over the first few plays, the player may have those kinds of knowledge gaps of the rules, but rule ‘pick-up’ after the first game seems to happen quite quickly and all of the above things I missed had a better chance of getting into my next few games. I am guessing that even those well versed in full ASL live with forgotten and remembered rules. In view of the above, I thought I should have another read of the rulebook before playing again and that made a big difference. Having played one game, a further reading made quite a few things pop out at me. There are a lot of one sentence rules tucked away within blocks of text, so a full re-read after play does help. Following set-up, this second play took 2 hours and 1 minute. I was surprised really because on embarking upon this three game quest, I just assumed that each game would play quicker than the one before as the learning curve was conquered, I think instead, I just got more out of the scenario. This game seemed to have more firefights and I became consciously aware that I had a better grasp of the rules and was doing more with them. The penny was dropping. German retreat that much harder. I used the same force as in game 1, so the Allies had to gain 18 VP’s to win. Almost straight away the American 9-2 leader took a wound and their forces had a hard time moving down the right flank. They got onto the hill amongst the trees and in this game I used smoke and there were Close Combats (none in the first game!). Anyway, throughout the game, the action in the woods ebbed and flowed without favour, the Germans lost their 8-0 leader in a close combat, so the rallying capability on that wing became a critical issue. hard fought action in the woods. On the other flank, the free French were held in check for several turns by a leader directed MMG sited in a wooden building. Halfway through the game, a successful (lucky) Prep Fire attack broke the Germans and the free French moved out of cover. There was a brief seesaw effect as the Germans recovered and then broke again, but by the game end, the free French had taken the building that housed the MMG. This time, the Germans were still in control of the hill. There was no need to retreat them and having lost only 7 VP’s worth of casualties, they were clear winners. I enjoyed the scenario much more from having a better grasp of the rules. Again, I used the same scenario and forces as before. The Germans set up and then I decided on doing something different with the Allies. They would all enter the board on only one flank, not the best thing to do as it turned out, but it made for quite a different game. 1/ This is the line of Russian prisoners that hinder the retreat path of the Germans if they choose to exit the map. 2/ All the Allied forces entered play into this wooded area. 3/ There is a building here, occupied by a leader directed MMG. 4/ fairly strong German forces (including 2 x LMG) are located here, expecting part of the Allied force to move against them on that flank (as in the previous games). 5/ this force has a LMG in a building to keep the Russians at arms length and to help cover any retreat. The 7-0 leader is the adjacent woods hex to act as rally point for routing units. 6/ this is the location that the Allies reach towards the end of the game. Their presence caused the Germans to pull back into the woods at the top of the hill, to stay out of reach on the last turn. difficult to break out from). 1/ realising that all the allied effort was on the other flank, the Germans re-position two LMG’s to rake the Allied flank. I learn the value of crossfires and got to understand that keeping the LMG’s adjacent to each other (instead of my 1 hex gap) could have created an effective firegroup. 2/ The Allied firepower broke the German units (silencing the MMG) and encouraging them to advance to the attack. 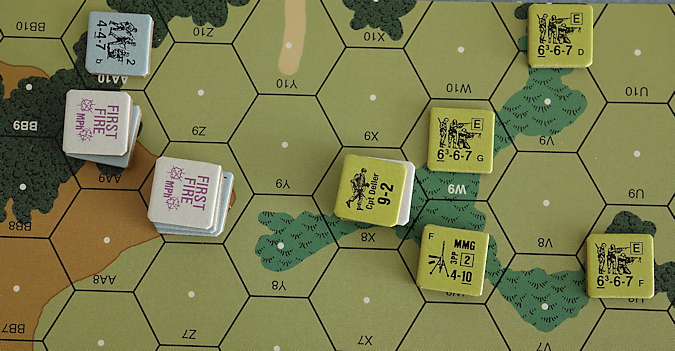 The German LMG’s (at 1) got lucky with the dice and soon the area was littered with residual fire counters and DM’d units, making this a difficult ground for the Allies to cross. 3/ The Close Combat here started out as a minor affair, but was not resolved in a single turn, allowing in subsequent phases for the two German units on the hill to join the stack and two nearby American units to do likewise. It would remain tense for another turn, but then it fell apart for the Germans, who lost three squads, it was a turning point in the game and the way was now open for the Allies to ascend the hill. 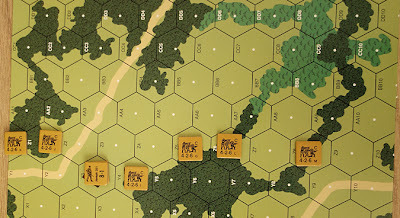 Game 3 took 1 hour and 46 minutes to play, though nothing really happened in turn 7 as there was something of a stand off following two American units being KIA’d on their way across the hill to the tree line. This time the Americans scored 15 VP’s, so another win to the Germans. I found it much easier to play the game this time around. There was cowering, ELR effects, residual fire, various defensive fires properly executed, machine guns not firing in the Advanced Phase after moving, Pin checks after leaders breaking etc, etc, and importantly, these things were done more automatically from memory rather than repeatedly diving into the rulebook. From first looking at the rulebook, I have been surprised that it has only taken three games (and quite a bit of reading) to get things properly up and running. It is worth saying this for the sake of those who may want to give up at an earlier point and need some encouragement to stick with it, please do. Once infantry can be confidently handled, it would be time to move onto the gun rules. It is quite easy to go through the Kit #3 rulebook to add them in, however Kit #3 does not give us a scenario that presents only infantry and guns, as all the remaining scenarios also include vehicles as well. That is understandable in a module about tanks, but from a ‘newbie’ point of view, using the kit as a gateway to the system, this is an issue as learning both guns and vehicles together is a lot to take on. Having an extra gun based scenario or two using the kit #3 boards would be helpful at this point. Hosting them on the MMP website would be a good solution. I will do one of two things, if my kit #2 shows up shortly, I will revert to that. If not I will just crack on and plonk some gun counter down to explore those rules. Moving to the fuller experience! Once the player can handle guns, the tanks become the next part of the learning cycle. Again, I would probably initially just put a couple of tanks out and practice with them, because the tank rules will be a real learning curve for me. Once ready, all the remaining scenarios are tank based, but I think I would select ‘Clash at Borisovka’ as a first game because it is a pure tank battle and I would be playing tanks, tanks and more tanks without any distractions. This post does not cover the playing of guns or tanks as I am not up to that stage of play, but I will return here with an update once I have dabbled with those rules. My latest exposure to the system via kit #3 is working out okay, though the module (quite properly) feels more intended for the player that is at the point of wanting to use vehicles, rather than the newbie who has yet to explore infantry and guns. This makes kit #3 a potential gateway game but not the best at doing that job, that crown undoubtedly belongs to SK #1 for the uninitiated new player. Turn 1 of the first game is taxing and probably the critical point at which a new player might drop out. I hope the above commentary of my first three games encourages new players to just press on and get some games under their belt. Hopefully all three starter kits will be fully available in stores soon. They all deserve a place in the collections of anyone interested in tactical gaming and I see their strength as being taken together rather than as individual modules. As a stand alone game, Kit #3 is a superb package, particularly for those who are already at the stage of wanting to explore vehicles. There is a lot of material in the box and this version of the rulebook gives a single source, fully integrated, catch all, ruleset for the ASLSK to date. I am more than happy with my purchase. There is an ASL player called Jay Richardson, who has produced a number of superb tutorial article that cover the three kits. These can be found at boardgamegeek and also in the ASLSK folder heading at consimworld. As a hobbyist, he has made a massive contribution in getting the bones of the system out in an informal and friendly format, showing BGG at it’s very best in terms of gaming community support - highly recommended. With the introduction of the starter kits, ASL is very inclusive, everybody has an opportunity to find the place that they want to be at in terms of complexity within the system. Well done to MMP and the ASLSK team who have made a tremendous effort to get this arm of the system to where it is today. Solitaire - At the moment, the system is not using concealment or much hidden placement, so it solo’s quite well. (As an aside, anyone buying the ‘Beyond the Beaches’ module should be aware that the three scenario’s are not solitaire friendly, though that module does give you board ‘P’ and rules for hedges, two of the scenarios use that board). Time - There are different scenario sizes, so between 1.5 and 2.5 hours once you are up and running seems reasonable. Be prepared for your early turns to take a long time as the rule book is frequently consulted, this will settle down fairly quickly through familiarity. Size - Most of the scenarios need 1 mapboard or 2 side by side, one scenario needs 3, so not much more than a 2 x 3 foot playing area would be fine plus a bit of side space for the scenario card and play aids. One of the scenarios (our infantry scenario) has two boards that are connected lengthways to each other, so a run of around 4 foot is need for that, though one of the boards can be fold back as only part is actually in play. Everything can be easily stored in the 1" deep game box. Complexity - It is a relatively complicated system (detailed tactical systems generally are). There are plenty of rules and plenty of exceptions, but the core infantry mechanics are actually pretty straight forward once you have them under your belt. The good thing with the starter kits is that you can really take it to your chosen level of complexity. Some players may be more than happy just to stick with the infantry module alone for occasional gaming, but there is the scope to go all the way up to full ASL and various shades between. If you play this system often, familiarity will in effect substantially reduce the sense of complexity. The whole point of the starter kits is to address the issue of getting into a complex system and taken together, they do that well. EDIT - I have just heard that MMP are looking at making ASLSK #1 available again as soon as possible - great news. EDIT (2) - A poster at Consimworld has provided links for Scenarios that can be used with kit #3. The first two links are for infantry only and will also introduce the player to a wider range of support weapons. The third link has vehicles. Edit (3) - I have now played Operation Brassard-1, a scenario by Laurent Martin (as given above). The Free French forces need to rely on British, Russian and American counters to get their full order of battle. The scenario requires that the main part of the town are rid of all good order German units. This has a very tight timescale for the Allies. I was not sure how they could do it, but on the final turn, they were in the town and every MP, every PIN result, every defensive fire mattered, making for an exciting game. turn, it was overwhelmed in a melee. The Germans won as they still had two good ordered squads in the town. The playing of this scenario took 2 hours and 10 minutes. 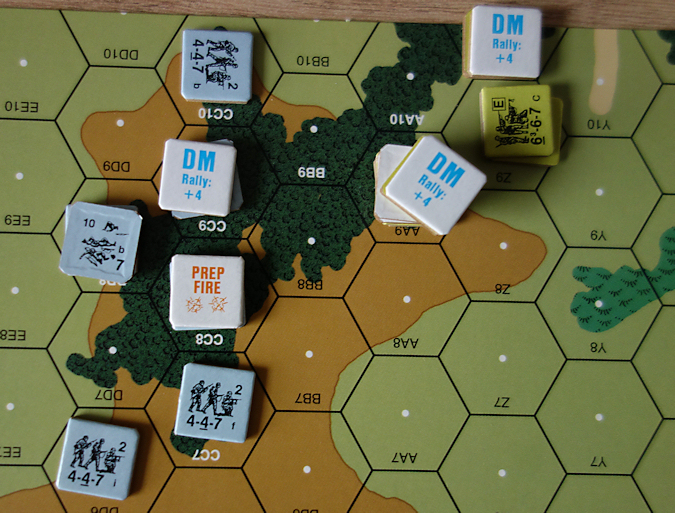 Edit (4) 21st Aug - Kit #2 has arrived from MMP and it has 3 infantry only scenarios. Looking forward to exploring this kit. I had fun with the first & second starter kit, but tanks were more trouble than they were worth. These days I'd rather play Conflict of Heroes if I wanted to drive armor around. I have pretty good handle on the infantry part of the rules and now think that guns look fairly straight forward. I have been looking at Jay Richardson's tutorial on tanks and the 'motion' thing sounds a bit complicated, so I will just try the rules and then go back to the tutorial afterwards. I am slowly working through the SK Infantry scenarios with both SK rules and Retro rules and finding similar play results so far and having a great time. Wish I had more time to play so I can be confident enough to head into guns and tanks. JRs tutorials are a truly excellent resource and very well written - rather like your blog. Thanks. Hi Paul, From my previous dabble with the system, I think it is really only repeated play that makes everything become second nature. As gamers, we are probably used to generally having a full grip on a new set of game rules before we even play our first game and that probably throws us a bit when first approaching these tactical games. There is a learning curve that goes beyond the first game. Interesting that you use Retro and find similar results, I have found the same, despite that during play, sometimes feeling that the Retro infantry fire table is under-powered. It all seems to work out. Great article...very useful to me as I am considering taking up an ASLSK for the first time. Thanks! Tanks in ASL are not complex, and we'll worth the effort. Nice review. Thanks. I wish the tank artwork was bigger and clearer.